A group of state Attorneys General can’t get their hands out of prisoner family pockets. 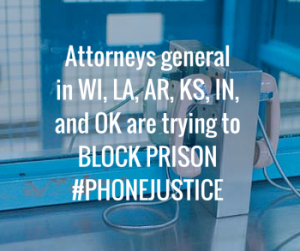 Now, attorneys general in several states are joining with phone companies to try to block this positive step towards criminal justice reform. Join the fight for prison phone justice and send them a message. If you’re not in any of those states, click here to take the prison phone justice pledge and share this post widely!